Market Profile indicator is a powerful tool developed by a CBOT trader. Its original purpose was to graphically organize price and time information obtained during a trading session in a manner useful to traders. Today’s Forex market is quite different from what commodity futures trading was back in 1985 when Peter Steidlmayer introduced his charting instrument to the public. Can Market Profile be a useful tool to Forex traders? In my opinion, it can. A rolling 24-hour window for Market Profile calculation. Each new bar, the Market Profile calculation window is shifted right by one bar as well. This way, a trader is always looking for the graphical profile of the recent 24 hours of trading. Unfortunately, this would require a complete recalculation of the whole curve with every new bar arriving. Smaller geographically-bound time windows. The Forex market operates through several widely recognized trading sessions. The most prominent of them are: London, New York, and Tokyo. A trader operating mainly inside the New York trading session could use a 10-hour window based on the NY open and close to calculate and display Market Profile. A trader operating within a mix of New York and Asian sessions could use the span of both. The good thing is that with this method, the calculation process is much simpler than with a rolling window. The bad thing is that it ignores all the market data that is left outside the target trading sessions. Weekly trading sessions. Unlike days, the weeks in Forex are clearly defined. The minor difference of Sunday/Monday open and Friday/Saturday close between different brokers and liquidity providers is small enough to ignore (one or two hours of thin-volume trading). Weekly Market Profile is easy to calculate and offers a lot of data to traders. However, it is rarely suitable to short-term intraday traders, less so to scalpers. Apparently, it is still possible to apply Market Profile to modern foreign exchange market. The most consistent approach in our case seems to be the third one, which is based on weekly sessions. Another important issue to solve when using this indicator in analysis is whether to apply it to the current session — and suffer from the lack of data during the early hours — or to the previous session, which could be based on stale data. In reality, this is no issue at all. As outlined in CBOT’s A Six-Part Guide to Market Profile, the most important profile is based on the current session, but the profile built during the previous one is also relevant and should be analyzed by a trader. Moreover, it is possible (and useful) to look on several previous profiles at once, looking at how the trend developed across more than one value area. Multi-session Market Profile analysis is also a key to detecting long-term areas of balance or detecting states of imbalance. In fact, long-term traders should be looking at Market Profiles of many sessions to determine possible points of entry and exits. Value area — the area of market acceptance. The price spent a hefty amount of time at those levels — the market likes it. 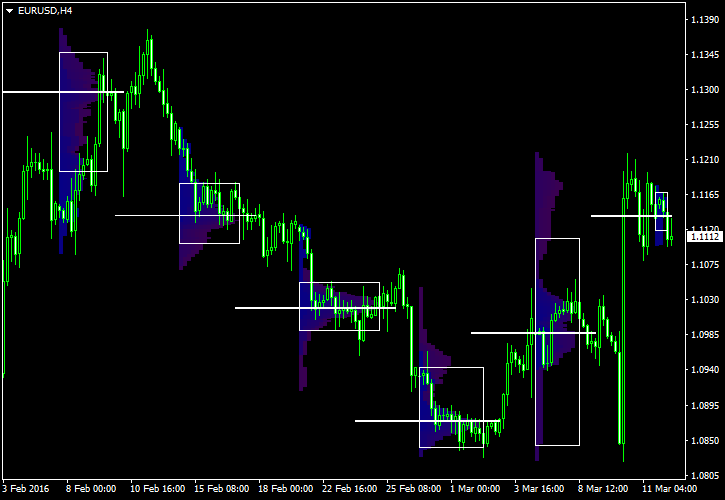 The edges of the value area form strong support and resistance levels. Median — the middle of the value area offers a strong pivot point. It serves both as the attractor for the price and as the bounce level. The median is also called a fair price. If market is below the level, it is considered undervalued. If it is above the median, it is overvalued. 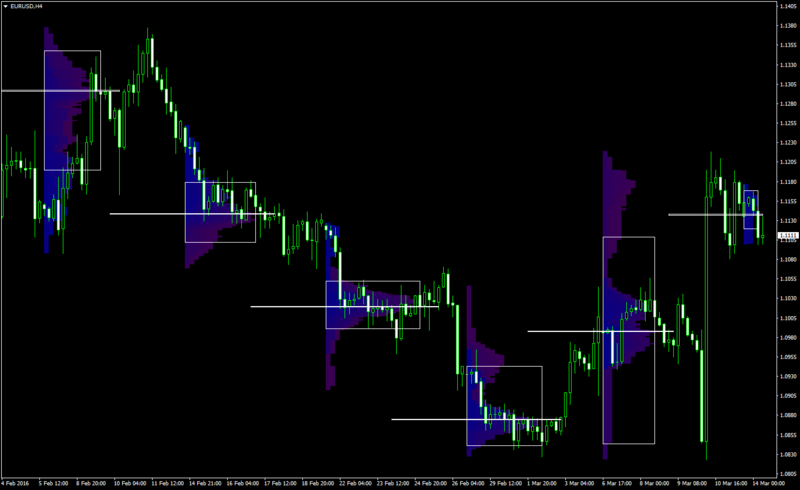 Areas of low volume — long tails below and above the value area show the price areas rejected by the market. Bottom tail is telling us of long-term buyers outperforming long-term sellers at those price levels. Top tail is telling us about the long-term sellers doing better than buyers at the respective price levels. I am not a regular user of Market Profile indicator. My main trading strategy is based on a different concept (chart patterns) while my other strategies are either automated with expert advisors or use fundamental indicators. Still, I do consult the long-term market profiles in times of doubt when I lack accurate information on where to put my entry order, take-profit, or stop-loss. Do you use Market Profile indicator in trading? I use it, but not in Forex. Yes, it is one of my main trading tools. Yes, but it is not my main indicator. If you want to share your opinion on what is the best way to use Market Profile in FX trading, please use the commentary form below.